"Joey Hartman had to woo Stefanie Schostak into a second date after their inauspicious first (“She rated it a 6 out of 10,” he says), but once she agreed to take in a football game together, the die was forever cast. 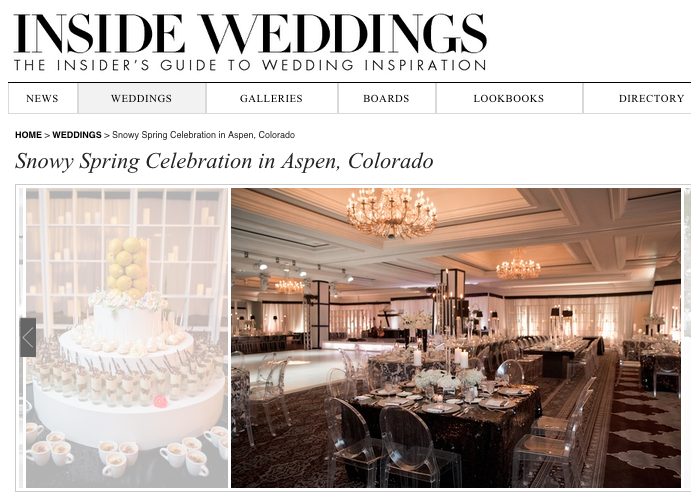 After their engagement, the couple immediately envisioned a wedding in Aspen, Colorado, a location where both of their families had created many happy memories. “[Also], we spent much time there during our courting stage,” says Stefanie. “We couldn’t imagine a more perfect and beautiful place to get married.” Guests were made aware of the significance of the destination via booklets sent in advance and also included in welcome bags that kicked off a weekend of events that concluded with the wedding. The overall look of the fête was modern and ultra chic, and the bride’s wedding dress was no exception. Her gown paired a stylish, fitted sheath with a voluminous train that swept to the floor in gathered tiers. Icy white roses accented Stefanie’s cascading bouquet of delicate stephanotis blossoms, and the groom’s orchid boutonniere echoed the bridesmaids’ florals, which also featured a cascade of stephanotis flowers. The courtyard of a luxury property served as the site for the couple’s romantic ceremony. Guests strolled beneath a canopy of tangled branches intertwined with lights to enter a tent made of clear panels that offered beautiful mountain views. Seating was set in the round, with aisles outlined by Aspen tree trunks crowned with flowers. A profusion of creamy roses, pale hydrangeas, and white orchids topped the couple’s custom chuppah, which stood on a lacquer platform. Once the Jewish wedding ceremony was complete and the ceremonial glass smashed, the reception began in the hotel ballroom. Guests found their table assignments etched on Lucite cards that dangled from an arrangement of tree branches accented by ice blocks and an elaborate ice sculpture dusted with snow. An enormous ivory dance floor took center stage, with tables of varying shapes and sizes surrounding it. Round tables were swathed in white linens patterned in black and crowned with mirrored tabletops. Silver holders of roses and hydrangeas encircled trios of tall, onyx Deco vases topped with hydrangeas and lilies. Long lacquer tables featured metallic candlesticks that burned with midnight-colored candles, as well as clear glass stands with candle shades in ebony. Small vanilla flower arrangements were lined down the center, and monogrammed menus were etched onto sheets of Lucite. Music was a major draw at the reception, and guests had a wonderful time dancing to a live band. “Both Joey and I went crowd surfing as the dance floor was on fire!” the bride exclaims. Another bonus? “Joey’s brother, along with a very musically talented NFL client, led a dozen of our male friends in a surprise serenade of ‘Stand By Me,’” she adds.